Buy Duracell Ultra 5003447 AAA Rechargeable Batteries 900 mAh (Pack of 2, Green) at Rs 305 only on Amazon. Duracell batteries are known to last much longer than ordinary batteries and with this rechargeable battery, you don’t have to worry about getting batteries for 5 years. Order now before the price goes up. Hurry!!! Limited period offer. 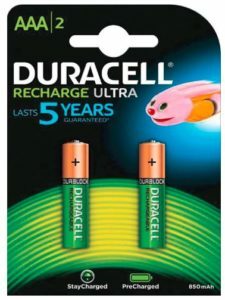 How to Buy Duracell Ultra 5003447 AAA Rechargeable Batteries 900 mAh (Pack of 2, Green) at Rs 305 only?